Despite the continuing recovery of the United States housing market since the 2008 downturn, foreclosure rates remain high. As foreclosures accumulate, so do unpaid property taxes. This presents an opportunity to investors who are willing to consider investing in property tax lien sales. Like many asset classes, tax lien investing requires a good bit of specialized knowledge to be successful. It is important to apprise yourself of all the pertinent facts before you venture your retirement capital into a property tax lien purchase. In this blog, we will cover the fundamentals of property tax liens and hopefully provide you with a baseline of information that will help you decide if this strategy is an option you want to explore for investing with your self-directed IRA or Solo 401(k). Tax liens are basically a cash-flow management strategy employed by local county or city governments. When a property owner doesn’t pay the required quarterly property taxes, then a municipality places a tax lien on his or her property. This lien represents the right to foreclose on the property if the owner fails to pay the taxes. In most states, the local tax authority can sell tax liens to private investors at auction, which gets the county the cash immediately and gives the investor the right to collect the delinquent taxes, as well as penalties and interest on late payment. This means that as the investor, you pay the amount of taxes owed up front and in return, you get the right to reclaim that money, plus interest from the property owner. In the United States, around six-billion dollars in tax liens are offered for sale each year. In 28 of the 50 states, plus Washington, D.C., Puerto Rico and the U.S. Virgin Islands, those tax liens can be sold to private investors. Interest on tax lien payments vary by state, and can range from 12 percent to 36 percent per year, depending on the state. For example, in Texas, the rate is 25 percent in the first 6 months and 50 percent in the first year, but in Arizona there is a 16 percent per annum ceiling. After you purchase the lien, the property is allowed a specified amount of time called a redemption period in which to pay the property taxes and redeem the lien. This period can last from six months to three years, varying by state. When the redemption period expires, you (the lienholder) can begin the foreclosure process and take ownership of the property. If the owner pays the taxes and redeems the property, you get back your full bid amount, plus the interest on the lien. While the high interest rates make tax liens an attractive investment, you should be certain that you are able to undertake the initial cash outlay, as well as fully prepared for the potentially lengthy wait during the redemption period. If you are seeking immediate cash flow from your investment rather than the potential for very high future returns, steer clear of the liens market. While liens have repayment priority (meaning they get paid first), even over first mortgages, there may be prior liens attached to the property, including liens from the IRS, which have priority over all the others. Since there is no warranty on the status of the title of the tax lien, these prior liens may interfere with your ability to claim the property if it is not redeemed. Additionally, it is important to know that lien properties are sold as-is, and may need extensive repairs. It is crucially important that you fully examine your financial situation, do your research, and consult with an expert before you consider this investment strategy. 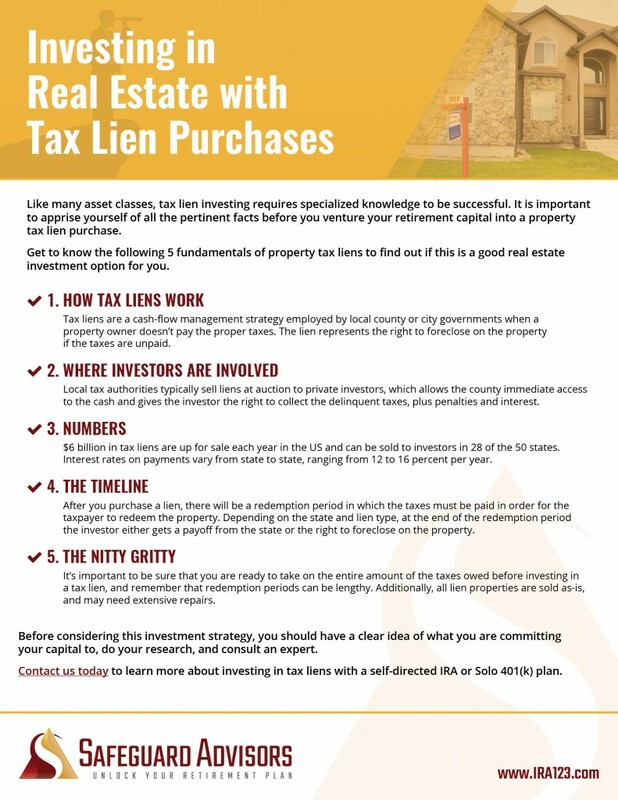 If you do all your homework and proceed prudently, purchasing tax lien properties can produce exceptionally high returns for your investment dollars.